This review constitutes part of a challenge series undertaken by myself and Simon from The Blether. 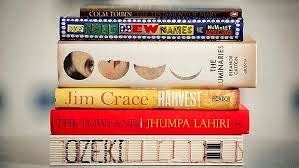 Experts are saying that 2013 was the year of the BIG BOOK and you only have to look at recent release lists to see that this is true. Weighing in at some 830 pages, The Luminaries is not the largest book on the 2013 Man Booker Longlist, but it is quite possibly one of the longest books ever to win- this tally includes 2009 winner Wolf Hall and it's sequel, 2012 winner Bring up the Bodies, both by Hilary Mantel. The Luminaries can also claim several other accolades. It is one of few offerings ever to win from New Zealand, and it's author, Eleanor Catton, was only 27 years old at the time she wrote it. If that's not reason enough to be jealous, it's also a remarkable book. In comparison to other books in the shortlist. Reviews in other news media praise Catton for her use of the astrological calendar, and her structuring of the book along a reverse fibonacci sequence, whereby each part is halved in length from the one preceding it. The effect is not unlike that of a steam train barrelling along at a seemingly unending velocity. As a result, what starts as an intimidating and confusing puzzle of murder and opium ends as a fast paced and compelling read. Walter Moody arrives in the goldmining town of Hokitika in January of 1866 only to find himself accidentally trespassing on a meeting of 12 other men in the smoking room of the Crown Hotel. These 12 men all know pertinent information regarding the mysterious death of a hermit, the drug overdose of a notorious but beloved prostitute, and the disappearance of a wealthy prospector. All suspect that something sinister is happening and that it's author is a man named Francis Carver, but no one man holds all the pieces. Moody, a law man with a recent strife of his own, steps in to play mediator. He hears all their parts in turn, and as a result, becomes perhaps the only man able to discern the truth. This is an ambitious undertaking- Catton must keep separate more than thirteen sides to the one story, not including those who are victims and perpetrators of the crime. She does so with great skill, and carefully guides her readers along, reminding them of pertinent information with an almost Hardy-esque flair for detail and observation. 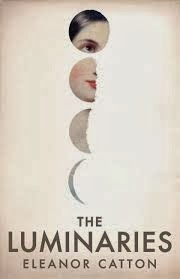 Indeed this novel is reminiscent of a nineteenth century novel in a number of ways, not withstanding its reliance on unlikely coincidences and the notion that the whole world is in fact like a tiny English village where everyone is connected to everyone else. Attention to dress and manners is skilfully played; scenes are never padded with unnecessary detail; and each character is as original as the one preceding it. 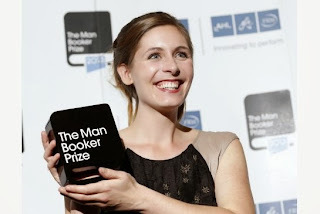 Eleanor Catton with her prize. If you have been put off by the size of this book; don't be. It's a marvellous book- perhaps one of the best things to come out of the Man Booker Prize in a number of years. More readable than Mantel, and certainly a lot more enjoyable than Julian Barnes, I beseech you to read The Luminaries. Twelve men in a room unknowingly yet serendipitously interrupted by a thirteenth; was this meeting written in the stars? Though long at over 800 pages, the story and the pace of the writing never slows down. The characters are well fleshed out and the prose is brilliant. Though I enjoyed the book, I bought it as a combo offer on all the Booker Prize Nominees Flipkart had. I was more moved by We Need New Names by Noviolet Bulawayo and A Tale for the Time Being by Rugh Ozeki. Had I read this as a stand-alone book perhaps, I'd have been more impressed.